EcoFintech Coop is a fintech cooperative ecosystem that provide crypto-economic and IT tools and services to autonomous economical entities. Ecofintech Coop is articulated around the Ama-gi Token (ISC Income Smart Contract and Governance by Incentives DAO) as a store of value, distribution of dividends and internal currency. EcoFintech Coop is federated within the Confoederatio DTRADE platform, being also its administrative organ. EcoFintech’s objective is to implement conscious financial technologies with regards to human resources and technical tools for use by individuals, communities and cooperative companies. The values which drive EcoFintech Coop are rooted in the confederalist, democratic organisational philosophy and sociocracy 3.0. Through this new political paradigm, the work undertaken goes in the direction of a systemic change which will gradually replace the centralised nation state governmental order with a new model based on economically sovereign and grassroots democratic autonomies; just as it will replace the market controlled by big monopolistic and non-ethical entities with a free market made up of fair and sustainable cooperative economies. The appearance of blockchain technology, a type of digital register (ledger) which is distributed across the internet and is incorruptible, entails a technological leap for Mankind. Blockchain technology is a disruptive kind of technology which will from now on enable each individual or social entity with an internet connection to gain access to a peer to peer network of value transactions and information transmissions, without intermediaries and invulnerable to fraud, blockades and censorship. Thus, what arises is the chance to get rid of the control, from a technical point of view, of third parties like banks and governmental institutions. And, therefore, blockchain technology is contributing to the construction of an alternative global economic space, in the form of a federated network of nodes of autonomous local micro-economies and international coordinations for fair commerce. However, new technologies and especially new financial technologies are not assimilated easily or used correctly by most people. Corporative state actors soon take over these new advances and transform their initial sense into a new tool for social control and egoist profits. In other words, profits which will then once again be reinserted into the old monopolistic system of kidnapped wealth, instead of helping to promote innovative new projects, services and liberated economic infrastructures, contributing to economic growth. The fact that it is possible to oust central entities like banks and state governments implies a growth of the responsibilities regarding individual and collective financial management, and a need for technical training and access to new electronic tools. This represents an obstacle for their autonomous adoption for social, ecological and humanist objectives, without depending on intermediaries or commercial products. EcoFintech Coop will extend a global federated network of “platform agnostic” local ecofintech nodes which will follow these principles, offering services to cooperatives, movements, communities, innovative companies and ethical investors, with the idea of building autonomy and contributing to fair economic growth and the redistribution of wealth, using at all times the most appropriate blockchain tool, without commercial affiliation to any specific platform. EcoFintech Coop will act as consultant to communities and cooperatives on financial-technological aspects and those linked to communications security; on digital governance; on crypto-economic strategies aimed at reaching financial independence; on management of cryptofunds and decentralised digital commerce; and on any other associated aspect. Education, training and information. Informing about the potential for social transformation available through new financial technologies and their practical application for bringing about concrete strategies. Analysing their risks and how to manage them. Informing and advising the community and their administrative organs about the use of the new blockchain technology for economic cooperativism and its use as a financial tool for free and democratic federalist entities. Commitment to the community. Promoting sustainable development, economic solidarity and social responsibility. Social justice. Supporting and energising fair and social local economies which allow for the development of effective public services accessible by anyone in any part of the world. Supportive and moral economy. Connecting autonomous territories, cooperative productive projects, innovative enterprises and grassroots democratic movements within an alternative global economic space. EcoFintech is a decentralised fintech cooperative organization. It is a fieldwork and technical team which uses the Confoederatio DTRADE financial and commercial peer to peer platform for linking autonomous economical entities around decentralized and fair commerce. On one hand, it will carry out an educational and local blockchain development intervention by way of projects (missions) brought about by an ecosystem of financial technical teams (ecofintech nodes). These missions will establish local nodes as fintech services for local democratic structures and grassroot movements. 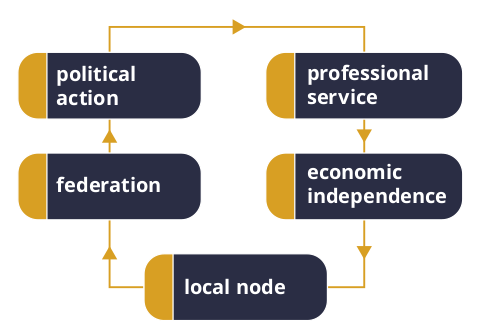 These nodes will be made up of members of the autonomous cooperative economical entities (enterprise committees, councils, municipalities, neighborhood assemblies, cooperatives…) and will be politically coordinated through the fintech comission of the Democratic Confederation of Cooperatives (CDC Association, registered in Helvetian Confederation). On the other hand, EcoFintech Coop will offer professional services to companies, institutions and private investors that coincide with a humanist and fair vision of blockchain technology. The synergie between both fields, public service and private initiative, result in the best implementation for real mixed economy in the environment of such nodes, bringing innovation, financing and market strategy to community projects, and social preference, resilience and sustainability in a new economic field fertile for investors. EcoFintech Coop will be organised into teams coordinated by commissions which will in turn be coordinated by the semi-DAO model GI-Governance by Incentives. The CDC Association is Project Manager for coordinating the development and field work. Permitting a canal of logical extension for the network and the integration of as many people as desired for the development of missions and tasks. Catalysing the network itself and organising the participants towards common objectives. Providing a transparent governance mechanism based on consensus and voting. Localnodes — Formation of ecofintech local nodes within communities. These nodes will act as the technical-financial teams of the local economical entities. Through the strategic use of the Confoederatio DTRADE platform that connects peer to peer sovereign territorial economical entities, they will promote the transition from the old bank and state financial system to the new autonomous and distributed model for productive economy. Opencomms — Creation of a resilient communications infrastructure. Remote access points for internet, mesh networks and autonomous internet, and training regarding techniques and use of tools which allow communities and individuals to access encrypted internet in situations of blockade or censorship (p2p, tor, vpn,…). Ecophone — Extension of the use of free software mobile devices which do not have spy software and privacy invasive firmware. Solibrokers — Management of cryptofunds and collective market strategies, allowing communities, individuals and cooperative entities to manage their stores of value, make investments in various cryptocurrencies or mutual funds, emit digital assets backed by their own goods, have access to decentralised futures markets, fragmentary properties, contracts for payout or dividend distribution… and emit or back their own local or social currencies, bonds, etc. Permastructures — Studies, design, financing and development of projects related to organic production, communal infrastructures, logistics, and ecoindustries which will back sustainable economic growth, thus empowering territories, producers and autonomous cooperatives and enterprises constructing a productive and eco-technological base upon which the new global confederated economy may be built. This entails backing for the emission of own digital assets and stable social currencies so as to avoid the volatility of cryptocurrencies based on speculative capital. This strategic investment model will avoid the dependence on external basic goods and commercial intermediaries, strengthening the circular economy. Private investors, institutions or companies can participate directly in the co-management and counselling of the productive and commercial community projects that they finance, thus allowing for better development and implementation. Opencomms (Internet Service Provider): Provides access service to private and mesh networks, offering greater security in the face of interventions by governments, agencies and criminals. Ecophone (Shop): A commercial distributor managed by the local nodes, offering communication devices and free software smartphones, as well as technical assistance. Open-source devices will provide greater security and privacy with regards to our communications, business and daily activities. The local nodes will have, by way of Ecophone, another commercial activity for their economic sustenance. Solibrokers (Crypto-fund Management): Fair financial products, mutual funds, fund management, purchase and sale of cryptocurrencies, creation of smart contracts, startups observatory and other financial management services using Blockchain-based conscious projects. Permastructure (Engineering): Strategic investments in productive economy’s projects which have the potential to cover new emerging economic spaces. Participating ethical investors will have the opportunity to learn about local, regional and transnational development plans carried out by various social and community initiatives. Private investment initiatives will be able to work together with democratic self-governments, municipalities, committees and cooperatives, participating in decision-making and advice. Ama-gi Token (AMA) is an income smart contract based on blockchain technology which will distribute EcoFintech Coop’s dividends and will be used as an internal currency and store of value. The non-corporative financial management model will therefore allow for a scaling up towards a decentralised organic management working through “Governance by Incentives”. In this way individual interests will be pursued as common interests, and common profits will affect individual profits. The Ama-gi Token will be split into shares which can then be acquired through money, work or responsibilities. The funds raised in the IEO-Initial Entry Offering will remain locked in the form of DAICO CGS-Coin Governance System, under the control of investors and democratic and transparent management. The first will be of a non-profit nature, offering services free or with a discount to projects which are constructing economic and democratic autonomy and are following the above-mentioned principles, and have low solvency. Through this line of work, EcoFintech Coop will plant its own investments in the territories as a cooperative, and will receive token shares on the profit generated in the future by the economic activities implemented. In the same way, autonomous economic entities federated under the CDC association will be asked to commit to maintaining at least 10% of their cryptosavings deposits in the Ama-gi fractions, maintaining the token’s fractions as a deposit of active value in the market. This will contribute to the extension of the infraestructure. The second will be aimed at ethical investors and clients with a social and humanist consciousness, offering professional fintech services. In this way, EcoFintech and the Confoederatio DTRADE platform will create the possibility to attract capital and private initiative to community development projects at an international level, offering their investors ethical, safe and profitable investment models. The terrain of social economy, sustainable ecological production and fair trade is a new fertile economic sector that has the potential to progressively displace the current monopolistic and inefficient global economic model. In this way, ethical investors and private or institutional entities can gain access, through the services described above, to both tools and new investment opportunities, becoming shareholders and participants of the confederal structure and the new global economy. All the internal economic activity and the profits obtained by these commercial services of the Ecofintech Coop sections (Localnodes services, Opencomms, Ecophone and Solibrokers) will be deposited 50% in the Ama-gi income smart contract, which will increase its market value and distribute dividends to the token holders, turning it in a real utility and equity smart contract. In addition, the Confoederatio DTRADE app (Lescovex’s technology white label license) will leave license commissions for each transaction in the Ama-gi income smart contract itself, in order to finance the ecofintech tasks of extension and maintenance of the network. Likewise, federated local ecofintech nodes will act as an agglutinant for new ethical companies and startups linked to the new technologies sector, serving as a blockchain incubator and accelerator for cooperatives and IT companies, contributing to local economic growth. These nodes will allow for local economic development in synergy with the community models and with the deepening process of democratic autonomy and confederalism. The new companies that connect with the values of the federation will enjoy clientelistic relations with the local economic self-administrations and other federated cooperatives, forming fair and ecological economy clusters, as well as participation in the global economic strategies of the federation through the Confoederatio trade platform. The cooperative members who are a part of the nodes in the ecofintech network will regularly participate in seminars and online academic and study programmes in politechnics in order to grow morally, develop critical thinking and broaden their abilities to assume responsibilities in crypto-economy. They will also go through technical training with regards to various professional sections. The academic methodology will have a discipline model, creating thereby a coherence and unity in the whole ecofintech organism and strengthening the members’ community bonds and their ability to coordinate executively. The criticism and self-criticism methodology will be used in order to improve individual abilities to act with respect, humility and empathy with regards to the various human social questions which must be understood and tackled from an economic point of view. The objective will be to help the members of EcoFintech be capable of working autonomously and with minimal supervision, with common principles and objectives, applying ethics to work and leaving aside vanity and competitive interests that corrupt relationships in companies and communities.